You know I totally forgot the other reason I personally call our detached bathroom guest-room the "plague bathroom"... when someone books it who felt they were duped into a shared bathroom situation was not bad enough, it is a cheap-skate attractant. For those who bring all their own food and pilfer anything that is not bolted down. They leave with no gratuity, take every soda, eat every cookie and on they go to the next place. I am only going to mention this once and not whinge about it. I am not upset or anything, stuff can sit for a long time and so they helped me move it out of the rotation. But I forgot about that aspect since we had it out of service for a while. Oh yeah, me thinks as I am up there restocking everything. As they filled the igloo with ice she said how many sodas do you want? to him and he looked over at me, and said "Whatever one you want to choose" and she stopped and felt my presence and stopped loading them up. An older couple from Illinois. I have not refilled the guest fridge sodas at all since last week, and have had plenty of people who could enjoy them, so as mentioned, this doesn't happen often, at all. This is why I try to not skip threads that seem uninteresting. You just never know. This tread is reeking havoc with my heart. I so LOVE Italy. Did not visit Venice so I must return! Florence & Rome stole my heart! I use to have a bowl of single wrapped little candies in each room but so many times guests would eat the whole darn bowl or empty it in their pockets. Also bottled water. I don't offer that any more but there is a cookie jar out in the lounge area. Store bought Walmart cream filled cookies. Some folks "OD" on those. For the price I charge, just decided they took advantage of everything that was available. (I charge 80 dollars per night per couple! Hotels start at 150.) And yes I am out in the country about 10 minutes from town and all amenities. So clean, quiet, and comfortable is what there is here! Sometimes the difference of $5 or $10 in the price does the trick, the question is... in which direction. Usually just $5 up does the trick and they find someone else to abuse. Okay... I'm going to admit two things. It would eat me up inside to steal cans of Coke like that, to me that's really stealing, if the intent was there to be consumed there. Re Second: Not if I can help it - best room. I will pay what my budget room is. Sometimes I have to remember that I should spend a bit more and get a bit more luxury. I'm to LV and I'm spending a whole $55 a night. But last year in Venice, it was over $230 a night. But that was in Venice on the Canal in a beautiful hotel room. Sometimes you just have to splurge. I want to go to Venice! I'm reading a series of books that take place there. Where did you stay? What did you go to see? This could be next year's trip! I also want to go to Tuscany. Decisions! We have not had the Italian tourists this year and I miss them! I love to ask where we should go and so many have invited us to call them when we're coming over. I forgot to mention that we seem to go in November/December, which is also when the high water is. 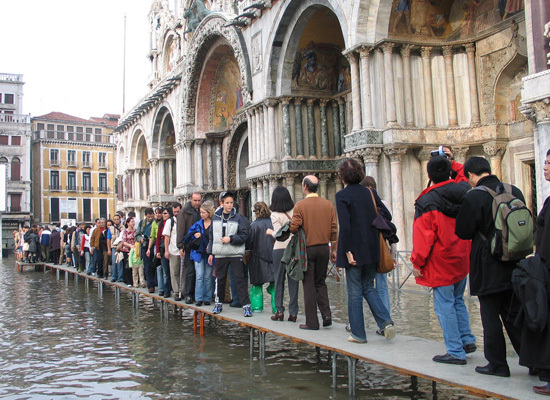 We have seen St Mark's square underwater a few times, now. Acqua alta, I was wondering what time of year that was. We stayed at Hotel Canal Grande (it was't our first time in Venice) and it was so beautiful. And in Florence we stayed at Hotel Silla and in Rome, Roman Residence. They were all wonderful. But the food in Florence was spectacular... I got some wonderful local recommendations. We have taken three cruises from Italy, one from Venice and two from Civitavecchia (not far from Rome.) I have to admit that is spectacular to sail out of Venice. Dh sailed in and out of Venice courtesy of the US Navy. Yes, but it's not the same. And it's going to get more and more rare as they are trying to ban the sailing out of the port for large ships that past St. Mark's Square. We love Venice and have stayed in both a B+B and an apartment...two totally different experiences, but both were great! The place has changed a lot over the 10 years that we have been going but it is still a wondrous place to visit. Let me know if you want some referrals. For Tuscany too. We have a couple of places we have stayed that you might like. LOVE VENICE!!! But also LOVED Tuscany. You need at least 2 weeks and you can do both. I had a friend who just did a 5 day tour of Italy....what a waste...you basically whiz by everything and then wonder what you saw when you got home. We did 10 days and I think we saw and did alot..but it was with a tour group. The only way to go for a first trip as far as I am concerned. We loved it because neither of us had to worry about driving in the crazy cities and we could relax and enjoy the sites. Also helped having an Italian speaking tour guide. I speak a bit but not enough. If we ever go back, I say we will rent a Villa and stay in Tuscany at least a month so then we can drive leisurely on our own...Not going back to the tourist traps....give me the quaint small towns. And maybe visit relatives in Calabria. Oh ...some day...only thing stopping me....an 8 hour plane ride back and forth and the airport hassles. Are you reading Donna Leon? They are also filmed as a tv series on Commasario Brunetti, in Venice, in German, with English subtitles, on Mhz http://www.mhznetworks.org/ online network. LOVE it, and MISS it now in Mexico. Yes! That's the series! And it's a TV show? Gotta look that up! We did for our anniversary last year - chose badly. New B & B that did not have a resident innkeeper - just a fill-in. Room was OK, breakfast was a disappointment. Would not have been that disappointed @ $100 (could have lived with it) but for $200? You bet! We were so disappointed with the dinner/theater were we went for our 1st anniversary that we never went back. Instead of a table for 2 we were at a table for 4. Had no idea they did not do tables for 2. Tablemates were smokers (pre-death-to-smokers-days) and not a pleasant mix. I currently have in my guest fridge - bottled water for guests (5 bottles), 1 POWER water, 1 pale ale, 1 B ed Light can,and 2 Hard Lemonades. The ONLY thing I put in there - ever - is the bottled water. Busted! But it wont alter the behavior. We only put the cookies in the individual rooms and have never stocked sodas. We have coke/diet coke if someone asks. Few do. I just keep them for dinner beverages for those who ask. I don't drink the stuff personally, better suited as toilet bowl cleaners! Most want coffee, tea or water, or really most just want ice for their own beverages.